Gymnasts look like bodybuilders. Gymnasts have very defined muscles and extremely low body fat levels. To build a gymnast's body, you must train in a similar manner. Their size and definition come from their training methods. Gymnasts train for strength, power, balance, coordination, agility and conditioning. According to trainer Gina Paulhus, "The first thing you have to realize is that gymnasts' bodies are a 'side effect' of their training more than an actual goal of the training. The gymnasts' muscles hypertrophy more or less as needed to aid their skill development and routine performance." 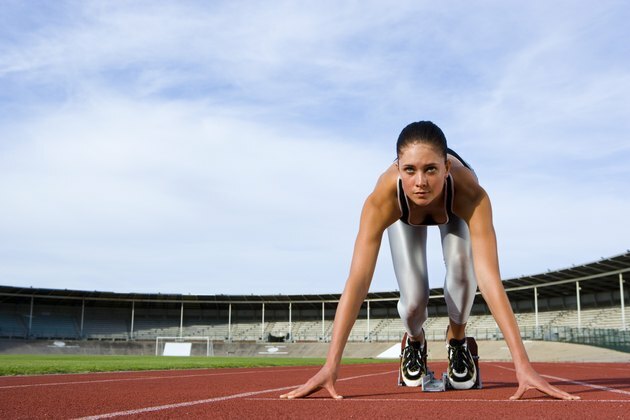 Perform cardiovascular exercises such as jogging, sprinting and interval training to build stamina and lose body fat. Gymnasts perform a variety of cardiovascular exercises to be able to have the stamina for long practices and meets. Gymnasts also must keep their body fat levels low. Too much body fat will hurt their energy levels, stamina and make them weigh more, making it difficult to push themselves during their routines. Perform core conditioning exercise drills such as leg lifts, crunches, planches and handstands. These drills will strengthen the core and define the abdominal and lower back muscles. Gymnasts require outstanding core strength. 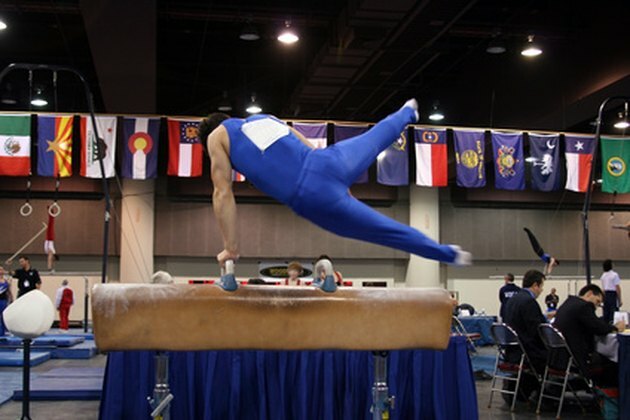 During events, gymnasts must use their core to pull and push themselves in different directions. This style of training gives gymnasts defined core muscles. Perform body-weight training routines. Perform exercises such as pushups, pullups, handstand pushups, body-weight squats and different planche positions. These exercises, which are done by gymnasts, promote muscle growth throughout the entire body. Gymnastics coach Christopher Sommer explains, "Now another question that we should ask ourselves--is the bodyweight training of the Olympians also beneficial to the fitness enthusiast? And if so, is it possible to apply at least some of it to those without a professional instructor to guide them or tens of thousands of dollars of specialized gymnastics equipment? And the answers are once again--yes and yes. There are some of our specialized exercises that are relatively easy to learn and require little or no equipment beyond a chinup bar and some floor space." Practice and perform the planche and front lever. These two exercises build strength and size in the entire upper body and core. During these exercises you hold your body in a static position and progress to other positions. Coach Sommer explains, "Basically these two exercises promote extreme strength and stability throughout the shoulder girdle both anteriorly and posteriorly. In addition, they'll trash your core and work your lower back/hips thoroughly." Consult a physician or certified trainer before attempting this program.